Addressing the Challenges Facing Our City’s Public Schools with ‘Principal for A Day’ – Connecting Students to Success! 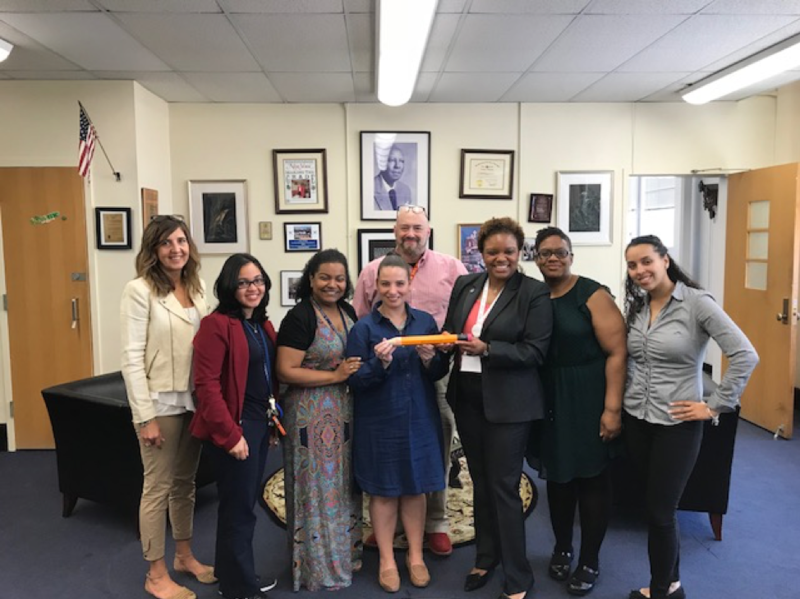 On Tuesday, May 8th, PENCIL, an organization devoted to ensuring the advancement of New York City students, made it possible for business professionals and school leaders to participate in a variety of activities that connected students to successful and caring adults. PENCIL holds a core belief that relationships have the power to create opportunities. ‘Principal For A Day’ not only succeeded in forming lasting relationships, but also opened both eyes and doors for all parties involved. PENCIL paired 108 high-level executives with more than 95 schools across the city and encouraged them to experience a ‘day in the life’ of a school principal. Who said going back to school couldn’t be fun? Viacom’s very own Khadijah Sharif-Drinkard, Vice President, Associate General Counsel of BALA, participated in the day’s festivities by volunteering at the same high school she attended, A. Philip Randolph High School in Harlem. Khadijah understands the value of a strong education and participated in the event with the goal of sharing her knowledge and expertise with those who could greatly benefit. Throughout the day, Khadijah initiated substantive discussions with students and faculty about the positive attributes of the school and ways to improve the experience for all. She shared, “I felt proud to know that I was able to contribute to the school, not only as an acting Principal, but also as an active alumna who cares deeply about the school community.” By connecting with the students directly in a common space and providing her success as an example to what they could achieve on their own, Khadijah was instrumental in creating a real difference that could be taken beyond the classroom. By day’s end, Khadijah and the many other professionals who volunteered across the city as Principals for the Day left students in their communities armed with the resources and tools they needed to believe in themselves and have faith in their abilities. The immense value of Khadijah’s experience can be seen through a single moment of the day shared below. ‘Principal For A Day’ was just the beginning of an ongoing movement aimed at building bridges and knocking down walls. The activities empowered New York City youth and challenged them to look at the future with optimism and to realize their true potential. Truly an empowering event that encourages us all to serve as mentors and help our future leaders achieve their dreams.